The Zelda timeline is more puzzling than a hundred Water Temples, but producer Eiji Aonuma has offered a tiny clue to where the new game fits. 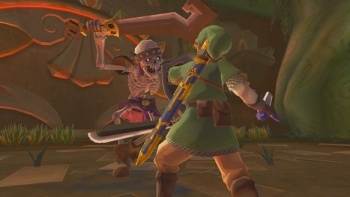 Does Minish Cap come before Majora's Mask? Does Link's Awakening come after Twilight Princess? Nintendo is very reluctant to say exactly how all the Legend of Zelda games fit together, but in an interview with ONM, Aonuma revealed where the upcoming Skyward Sword is placed, albeit it in a vague way. Aonuma said that having discussed the reveal with Shigeru Miyamoto, he was able to confirm Skyward Sword came before Ocarina of Time. This likely won't come as much of a surprise to Zelda historians, as it's already been revealed that the Skyward Sword turns into the Master Sword, meaning that the game pre-dates any game that has the Master Sword in it, but it's unusual to get that kind of definite confirmation. The reason that Nintendo kept the timeline under wraps, Aonuma said, was so that it didn't constrain itself when it came to making new titles; saying that if he said a particular title was the first Zelda game, Nintendo would be unable to make a game before that. "For us to add titles to the series," he added. "We have to have a way of putting the titles before or after each other."